One thing that makes Samsung's flagship Galaxy smartphones stand out from the Android masses is the curved display. Officially branded as the Edge screen, the technology was first introduced on the Samsung Galaxy Note Edge which launched alongside the Samsung Galaxy Note 4 in September 2014. The curvaceous tech means that part of the AMOLED screen extends over the side of the handset to squeeze a bigger display into a smartphone without increasing the physical size of the device. This not only gives the smartphone an elegant look but it also adds new functionality – users can add app shortcuts to the screen's edge, see snippets of information such as news and weather on it, and use it to get coloured notifications, which can be seen when the handset is face-down, for things like calls and messages. What can also be seen (or rather not seen) on the drawings of the full screen device is a complete lack of buttons, notches or holes on the front, suggesting an in-screen fingerprint reader, and either an in-screen or pop-up camera (perhaps like the Xiaomi Mi Mix 3). On the bottom of the phone is a USB-C socket and there's a dual camera on the rear. Don't freak out, but there is no headphone socket. Xiaomi has bold ambitions. It's the fourth largest smartphone manufacturer in the world and it recently launched in the UK bringing the Redmi 6A, Xiaomi Mi 8, and Mi 8 Pro to the Three network. 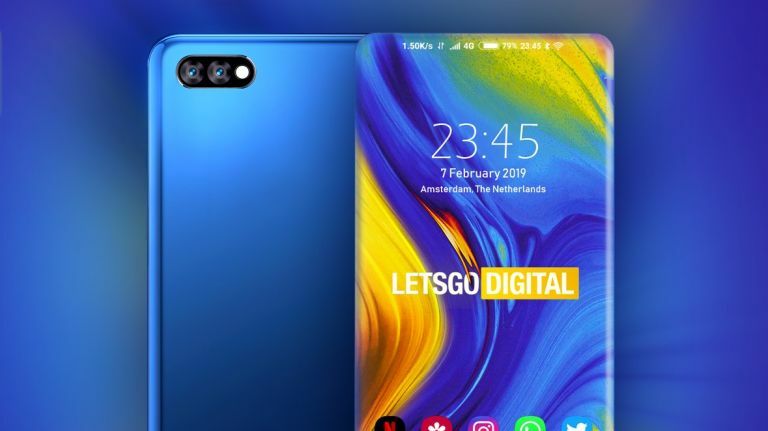 In January it showed off a prototype of its new folding smartphone, and it is planning to launch a 5G-enabled smartphone at MWC 2019 on February 24, 2019 – beating the Huawei P30 Pro release date by a handful of weeks. If the phone in the patent drawings becomes reality then Xiaomi could have a strong challenger to go toe to toe with Samsung and Huawei. And given that the Chinese manufacturer's mission is to sell highly spec'd products at low prices, this particular handset could just give the premium phones a real run for their money.